Switzerland, officially the Swiss Confederation, is a country situated in western, central, and southern Europe. It consists of 26 cantons, and the city of Bern is the seat of the federal authorities. The sovereign state is a federal republic bordered by Italy to the south, France to the west, Germany to the north, and Austria and Liechtenstein to the east. Switzerland is a landlocked country geographically divided between the Alps, the Swiss Plateau and the Jura, spanning a total area of 41,285 km2 (15,940 sq mi) (land area 39,997 km2 (15,443 sq mi)). While the Alps occupy the greater part of the territory, the Swiss population of approximately 8.5 million people is concentrated mostly on the plateau, where the largest cities are to be found: among them are the two global cities and economic centres Zürich and Geneva. The development of 5 different taxes between 1990 and 2010, which account for 80% - 85% of the annual revenue. The Swiss federal budget (German: schweizer Bundesbudget) refers to the annual revenue (money received) and expenditures (money spend) of the Swiss Confederation. As budget expenditures are issued on a yearly basis by the government, the federal council, and have to be approved by the parliament, they reflect the country's Fiscal policy. The budget principles are defined by the Swiss Constitution and have been restated most recently in the 1999 fiscal guidelines of the confederation. In 2010 the federal budget of Switzerland had a size of 62.8 billion Swiss francs, which is an equivalent 11.35% of the country's GDP in that year. In 2014 the federal budget of Switzerland had an estimated size of 66.353 billion Swiss francs, which is an estimated equivalent 10.63% of the country's GDP in that year. Modern Fasnacht costume from Basel. Fasnacht, a mixture of Christian and pre-Christian beliefs, is a pre-Lenten Carnival. Swiss folklore describes a collection of local stories, celebrations, and customs of the alpine and sub-alpine peoples that occupy Switzerland. 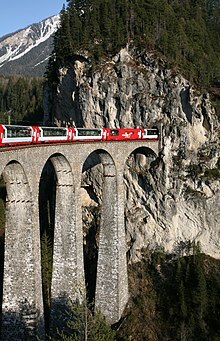 The country of Switzerland is made up of several distinct cultures including German, French, Italian, as well as the Romansh speaking population of Graubünden. Each group has its own unique folkloric tradition. The Federal Constitution of the Swiss Confederation (SR 10, German: Bundesverfassung der Schweizerischen Eidgenossenschaft (BV), French: Constitution fédérale de la Confédération suisse (Cst. ), Italian: Costituzione federale della Confederazione Svizzera (Cost. ), Romansh: Constituziun federala da la Confederaziun svizra) of 18 April 1999 (SR 101) is the third and current federal constitution of Switzerland. It establishes the Swiss Confederation as a federal republic of 26 cantons (states). The document contains a catalogue of individual and popular rights (including the right to call for popular referenda on federal laws and constitutional amendments), delineates the responsibilities of the cantons and the Confederation and establishes the federal authorities of government. 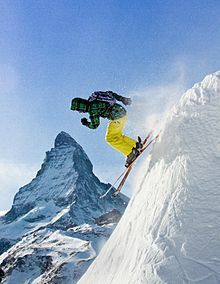 In Switzerland, most of the people have a regular sport activity and one in four is an active member of a sports club. The most important all-embracing organisations for sports in Switzerland are the Federal Office of Sport, and the Swiss Olympic Committee (Swiss Olympic). Map of the territorial evolution of the Old Swiss Confederacy (1291–1798). 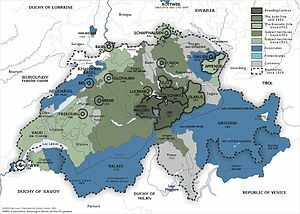 The territorial evolution of Switzerland occurred primarily with the acquisition of territory by the historical cantons of the Old Swiss Confederacy and its close associates. This gradual expansion took place in two phases, the growth from the medieval Founding Cantions to the "Eight Cantons" during 1332–1353, and the expansion to the "Thirteen Cantons" of the Reformation period during 1481–1513. Christianity is the predominant religion of Switzerland, its presence going back to the Roman era. Since the 16th century, Switzerland has been traditionally divided into Roman Catholic and Reformed confessions. However, adherence to Christian churches has declined considerably since the late 20th century, from close to 94% in 1980 to about 66% as of 2017. Furthermore notable is the significant difference in church adherence between Swiss citizens (71%) and foreign nationals (50%) in 2017. Tourists are drawn to Switzerland's diverse landscape as well as activities. Most interesting are the Alpine climate and landscapes, in particular for skiing and mountaineering. The pharmaceutical industry in Switzerland directly and indirectly employs about 135,000 people. It contributes to 5.7% of the gross domestic product of Switzerland and contributes to 30% of the country's exports. Language distribution in Switzerland (2000). The Romandy is shown in green. Voting in Switzerland (called votation) is the process by which Swiss citizens make decisions about governance and elect officials. The polling stations are opened on Saturdays and Sunday mornings but most people vote by post in advance. At noon on Sunday (Abstimmungssonntag in German, Dimanche de votation in French), voting ends and the results are usually known during the afternoon. The Council of States (German: Ständerat, French: Conseil des États, Italian: Consiglio degli Stati, Romansh: Cussegl dals Stadis) is the smaller chamber of the Federal Assembly of Switzerland, and is considered the Assembly's upper house, with the National Council being the lower house. There are 46 Councillors. The territory of modern Switzerland was a part of the Roman Republic and Empire for a period of about six centuries, beginning with the step-by-step conquest of the area by Roman armies from the 2nd century BC and ending with the decline of the Western Roman Empire in the 5th century AD. 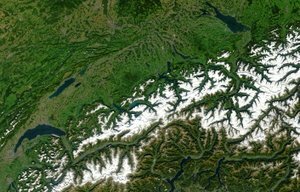 This page contains a sortable table listing all major mountains and hills of Switzerland. The table includes all summits that have a topographic prominence of at least 300 metres (984 ft), regardless of absolute height or other merit, ranking them by height and prominence. For a list of mountains with lower prominence, see List of mountains of Switzerland above 3000 m and List of mountains of Switzerland above 3600 m. For a list of mountains including topographic isolation, see List of most isolated mountains of Switzerland. ... that the extinct ant Odontomachus pseudobauri was bought from an amber dealer in Basel, Switzerland? ... that the Swiss government made detailed plans to acquire and test nuclear weapons during the Cold War? ... that in Osmanoğlu and Kocabaş v. Switzerland, the court ruled that compulsory mixed-gender swimming lessons in public school do not violate the freedom of religion of Muslim families? ... that cheese soup, referred to as Kassuppe, is a specialty dish in Central Switzerland? ... that the 2018 Zürich ePrix was the first circuit car race held in Switzerland since the 1954 Swiss Grand Prix at Bremgarten? ... that Switzerland's Poya Bridge was constructed together with an adjacent tunnel containing an underground roundabout? Do you have a question about Switzerland that you can't find the answer to? For editor resources and to collaborate with other editors on improving Wikipedia's Switzerland-related articles, see WikiProject Switzerland. Köppen-Geiger climate classification map for Switzerland. Founded in 44 BC by Lucius Munatius Plancus, Augusta Raurica (near Basel) was the first Roman settlement on the Rhine and is now among the most important archaeological sites in Switzerland. Entrance of the new Lötschberg Base Tunnel, the third-longest railway tunnel in the world, under the old Lötschberg railway line. It was the first completed tunnel of the greater project NRLA.